This updated version of the popular War of the Ring Card Box features new character art, with a great portrait of Gandalf the Grey and the symbol of the Free Peoples. For dedicated gamers who need to keep their War of the Ring Second Edition and in its expansions cards in perfect shape, this accessory is the perfect solution to store and protect them. 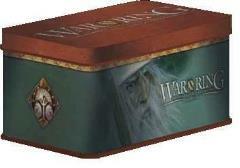 Included in this set are: 120 custom card protectors, fitting the tarot size cards used in the second edition; an exclusive sturdy full color tin box using fantastic artwork by John Howe, embossed with the "War of the Ring" logo.